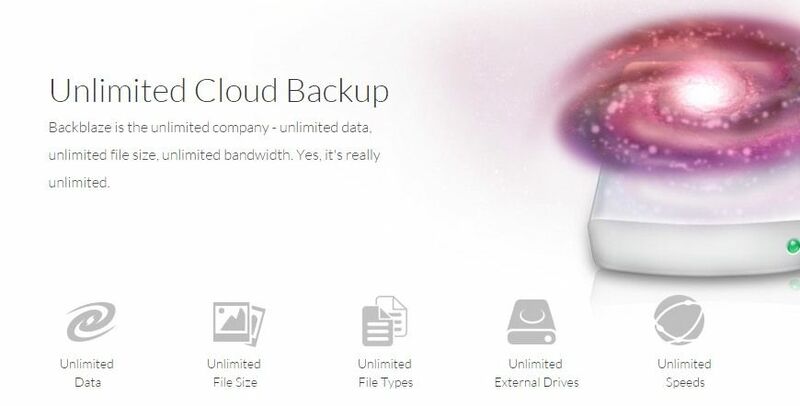 Online backup is essential to most people nowadays, due to the amazing versatility and unique convenience that this service is able to offer. Since online storage can lead to significant benefits, nobody can argue that there is substantial need for companies providing such benefits to the customers, at the most competitive price rates. One of these companies is Backblaze, launched back in 2007 and providing unlimited bandwidth to all the subscribers who choose to store their precious files on their servers. This is what has intrigued us to proceed with a thorough review of this cloud backup provider; stick with us and find out what we have come up with right away! There are many different situations that can lead to data loss, among which we should refer to computer crashes and user’s errors, natural disasters, malware or hacking attacks and power problems. For all these reasons and for many more, secure online backup is imperative! On the bright side, there are extremely trustworthy companies that have created wonderfully efficient plans that live up to the expectations of the public and match their demands. This brings us to the reference of the major features of Backblaze, one such company in the field of online storage! As it has been stated above, Backblaze is able to provide its customer with unlimited bandwidth and data storage. With 256-bit transfer encryption and 128-bit AES storage encryption, security seems to be of paramount importance to this company. Indeed, there is the extra option of providing a private personal encryption key to whoever wishes to make use of this added layer of protection online. Backup can be scheduled either automatically to occur continuously or once per day, or even upon your manual command. Backblaze boasts amazing speed and another benefit that you get is definitely that of locating your stolen or lost device. Files are stored in their older versions for up to 30 days, which could be even lengthier. The data centers of Backblaze are located in the United States, one in Oakland and one in Sacramento. We found Backblaze truly straightforward, when it comes to the pricing for online backup services. In fact, there is only a single plan that you can choose and the options that you get have to do with its duration. To be more specific, monthly fees stretch to $5 and there are longer commitments at $50 for a whole year and $95 for two years. What is great is the fact that you can try out the services for a whole fortnight for free – and then decide if you wish to proceed with the real thing or not. Online storage for free should never be ignored, after all! As for the payment options that are accepted by Backblaze, things could be a bit better. Instead, generally only credit cards are welcome for paying your subscription (American Express, Visa / MasterCard). We move on to the next part of our review and this is where we focus on the help and support department of this backup service provider. Here, we find a well organized knowledge base and a blog, where we can search at the respective bar and gaze through the posts and find out more information on online backup and cloud storage Backblaze offers. Other than that, we can submit a ticket via email and ask any question that requires further explanation. The how-to guides available are also an excellent way for ensuring that everything has been set up properly and that we are ready to profit from our subscription to the fullest. Last but not least, there is live help available to turn to (although it does not operate 24/7 and this can cause some discomfort at times). 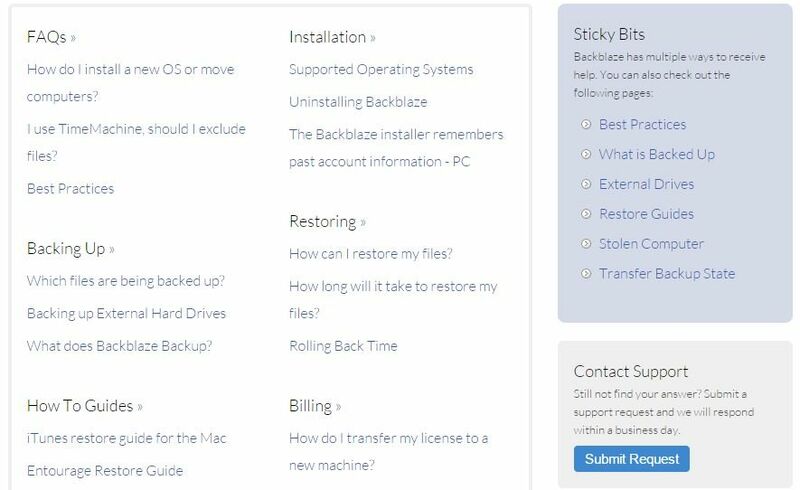 One of the major things that have caught our attention about Backblaze online backup, is that, it is compatible with a lot of different devices and OS. Of course, it is compatible with Windows (as most other services in all fields of computing) and Mac. Apart from that, there are apps that can be found either at the Google Play Store or at the Apple Store. This means that you can sleep tight at night, whether your mobile runs on Android or on iOS. The only problem seems to be the lack of compatibility for Linux OS. However, this is common practice and it is something that we have encountered in many different service providers. After having completed our unbiased review, we are ready to sum up the pros and cons that we have come across throughout our experience with this online backup service. All in all, it is a reliable solution for those who want to figure out a way as to how to store their files and keep everything thoroughly protected online. Encryption is solid and there is no limit as to the overall data transferred and stored. The price is pretty affordable and particularly for the yearly and biannual contracts. You can use Backblaze on every device and OS, with the exception of Linux. Their support is above average and they offer a generous free trial of a fortnight. Although their payment options should be multiplied and with any potential delay in the preparation of files prior to their storage, Backblaze does not cease to offer competitive services in the demanding field of online storage. Backblaze offers a reliable online backup service to all customers, with unlimited backup data and a super inexpensive plan. All the files are encrypted and its setup and usage are really simple; on the downside, it can be a bit slow to prepare files for backup and the old versions of files are not stored infinitely. Overall, Backblaze online backup is certainly recommended for the services provided. Ali is an Internet security research enthusiast who enjoys "deep" research to dig out modern discoveries in the security industry. To be frank and honest, Ali started working online as a freelancer and still shares the knowledge for a living. He is passionate about sharing the knowledge with people, and always try to give only the best.